Never satisfied with the status quo, Sepro’s heavy investment in research and development has produced some of the most innovative mineral processing equipment available. One of the key ingredients to our groundbreaking designs is simplicity. Our Tyre Drive Scrubbers, Grinding Mills, and Blackhawk Cone Crushers are just a few products that exemplify a simple yet effective design. Here is how we minimize equipment downtime, so your project can stay up and running. Our research team analyzes what parts break down first and most frequently on standard mineral processing equipment to see where improvements can be made. On traditional rotary scrubbers and grinding mills, steel support wheels and riding rings wear out often and need to be constantly re-ground to reduce vibration and keep a consistent operating angle. We addressed this issue by eliminating the steel wheels altogether in our rotary scrubbers and grinding mills replacing them with commercial heavy truck tyres that can be locally sourced. The tyres are mounted on independent gearboxes, providing an alternative to standard chain and gear drive systems. With this design, we were also able to eliminate critical components such as ring gears, chain drives, and trunnion bearings. 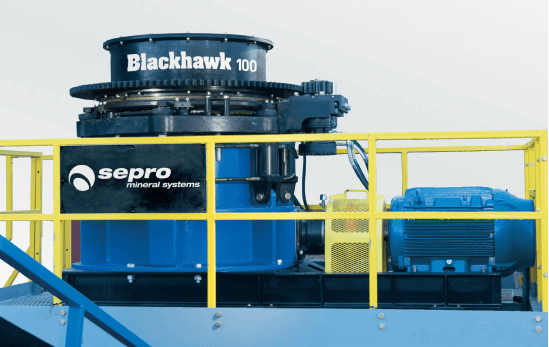 Our Blackhawk 100 Cone Crusher is also designed to eliminate certain high-wear parts. Unlike most cone crushers, the Blackhawk’s lock bolt design eliminates the need for a torch or burning ring. This combined with the fact that it is driven via a flexible coupling leading to the electric motor means no sheaves or v-belts are needed either. With outside the box solutions, we are able to develop mineral processing equipment that eliminates high-wear parts, keeping your machines up and running for longer periods. Our mineral processing equipment is designed to be rugged and robust, but at some point, all machinery will need maintenance. We know how tough it can be to service equipment in remote mining areas around the world, so our tyre drive units are built with standard off the shelf major components for customer convenience. No burdensome foundation requirements are needed for installation either, saving both time and money. With offices in 94+ countries, parts are always readily available for all Sepro products. Our team of logistics experts can deliver equipment and parts to even the most remote operations. If you’re looking for simple, yet effective aggregate solutions, contact a Sepro expert today. We can answer any questions you have about our innovative mineral processing equipment and provide custom solutions to any issue you may have.